A cracking day weather-wise but strangely, a very low turnout when we may have expected the opposite after the place was crowded out last year! The result was one match with ten riders staged concurrently with a second of eleven, with all three age groups randomly thrown into the mix. Of course that meant not everyone raced all of their peers, which meant after the main five-rides-apiece event, there had to be a couple of repechage heats to sort out who went into which of the six possible finals! (Poor Fred Rothwell gets little peace when it gets this complicated!). Fortunately the cross-over of the two meetings meant healthy rests between rides, even for those with two on the trot which took away most of the pain under a scorching sun with only occasional could cover. The segregation plus a number of heats with just two or fewer riders offered more opportunity than normal for big scores and we ended up with several riders on similar totals and a couple of 20 point maximums after the 40 normal heats! First up was Super Viking Mark Mulvey with an unbelievable performance to head Group A on his first visit to an Orchid round, looking strong and a lot fitter than of late. Group B winner was Hellingly’s much-travelled Martyn Hollebon. Jason Burke and Mark Winwood were standout performers in the B set while Dave Meanley and Viking Jason Keith ran Mark close in the A’s. 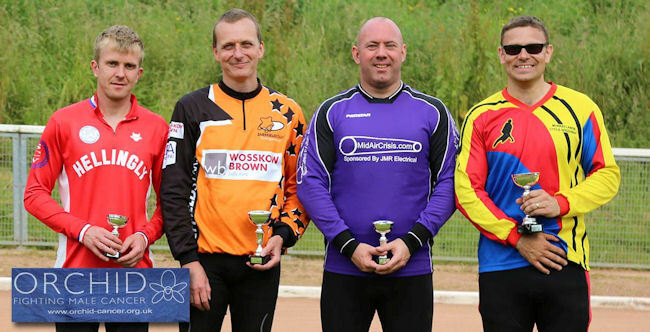 Jason went on to win the Over 40s B Final while Mark suffered from JB’s dive underneath which cost him dear after leading the first two laps of the A Final. 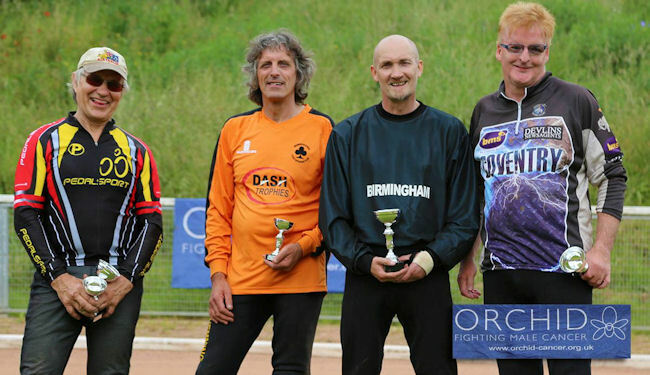 The Over 50s ultimately produced a fresh winner, Brummie and good Vikings pal Stevie Hodgkinson at last getting his reward with a great performance to win his first A Final after a solid display, while our own John Wilson had tongues wagging in the pits, most of his opponents having never heard of him. So some excellent stuff from the top Northumbrians today but my Man of the Match has to be our very own Jim Graham. On a day when the heat was surely a bigger problem for us Oldies, Jimmy produced possibly his best display since the 1980s when he last rode seriously, really getting stuck in and challenging well. His tangle with Mark and Mick in heat 8 left him on the deck battered and bruised but where he got the speed from to dive under them both only he will know. Great to watch his performance today. Poor Mick Aris suffered a rare gate exclusion (probably the same noise in the skate park that cost me last year!) and a slip while leading another race which left him with an uncharacteristically low score, while his own fued with a flying, fast-gating Fred Rothwell in the Over 60s A Final was the move that gave me the win on a plate. 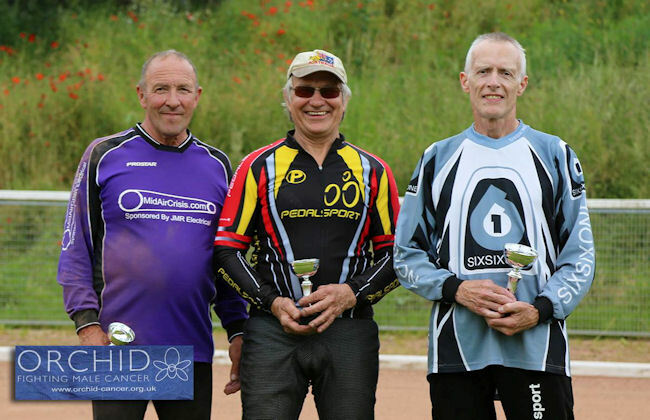 Another rider in the wars was Paul Timms, this surely being the first time the current Champ has missed out on the Over 50s A Final after a terrible fall when tangling with Joe McLaughlin. Paul got small consolation by winning the B Final chased all the way by the impressive John Wilson..